Jonathan Edwards is primarily remembered today as a gifted and influential theologian. But in eighteenth-century America, his preaching resounded from pulpits throughout New England, sparking the flame of revival that became "The Great Awakening." As the fame of this Puritan pastor and preacher of revival spread far and wide, his sermons galvanised many of his listeners into reexamining their lives and faith. Ever alert to the dangers of the religiously complacent - those who only observed the surface requirements of religion - Edwards tirelessly proclaimed the overpowering majesty and grandeur of God, and humanity's hopelessness for moral improvement short of his grace. This stirring selection of twenty messages allows readers to experience the words that swept through this young nation with a message of repentance and a call to action. 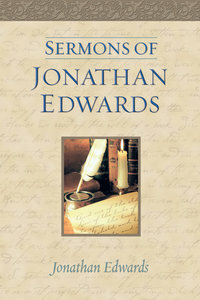 About "Sermons of Jonathan Edwards"
Jonathan Edwards is primarily remembered today as a gifted and influential theologian. But in eighteenth-century America, his preaching resounded from pulpits throughout New England, sparking the flame of revival that became the "Great Awakening." As the fame of this Puritan pastor and preacher of revival spread far and wide, his sermons galvanized many of his listeners into reexamining their lives and faith. This stirring selection of twenty messages allows readers to experience the words that swept through this young nation with a message of repentance and a call to action. Jonathan Edwards (1703-1758) is widely acknowledged to be America's most important and original philosophical theologians. He is known as one of the greatest and most profound of American theologians and revivalists. He was the foremost leader of the Great Awakening in North America in the 18th Century. His writings continue to have a marked influence today on the life of the Church, his example stands as a beacon to guide us from the shallows of our low levels of spirituality to the deeper waters of life. Jonathan Edwards wrote such classics as Sinner in the Hands of an Angry God, Sermons of Jonathan Edwards and Call to United, Extraordinary Prayer.- Publisher.